Apparently Cats is coming back to the London stage. Nothing strange in that of course, musicals return all the time. Miss Saigon is also reopening this year and Carousel is back too. Often these new runs are more successful than the original ones too, the 1975 production of Chicago played a respectable 936 performances but the 1996 revival ran for fifteen years. There’s clearly money in the old shows. Obviously Andrew Lloyd Webber has harnessed/enhanced this with his Saturday night ‘find a star’ TV shows relaunching productions of The Sound of Music, Oliver, Joseph, Wizard of Oz and Jesus Christ Superstar. Personally I think it’s time he took a look at Little Shop of Horrors. Just think of it, each series take its name from the lyrics of its respective musical so they could call this round of the show ‘Someone Gimme a Shot (or I’ll Rot Here)’. How about ‘What do you want from me, blood?’. The hopeful contestants, required to master a new showstopper every week ready to face the public vote, might relate to that. Also, consider the fact that the big inspiration for new musicals at the moment is cinema so a 35th Anniversary production of Little Shop could ride that wave too. We already have Billy Elliott, The Bodyguard, The Full Monty, Dirty Dancing, Footloose, The Commitments, Once, Shrek, Legally Blond, Made in Dagenham and Spamalot to name a few. There is even a Back to the Future Musical promised for next year, presumably to open on 21st October 2015. It makes perfect sense; classic musicals, popular movies, 80s nostalgia? Now is definitely the time for Mushnik’s Flower Shop to reopen its doors. Little Shop of Horrors’ earliest incarnation was the 1960 film directed by Roger Corman, which itself is thought to be based on two short stories; Green Thoughts by John Collier and The Reluctant Orchid by Arthur C. Clarke. This original film became a bit of a cult classic and Alan Menkin and Howard Ashman used it as the inspiration for their off broadway musical. The show initially ran for five years by which time it had already been turned into another movie, the one we all know, by Muppeteer Frank Oz. It is perhaps a little odd to think that Menken and Ashman started out writing subversive blackly humorous musicals, famous as they now are for their work on the ultra wholesome Disney animated features. After all, these are the men who wrote the songs and music for The Little Mermaid, Beauty & the Beast and Aladdin. Howard Ashman sadly passed away before Aladdin was released but after this point Menken went on to score Pocahontas, The Hunchback of Notre Dame, Hercules, Enchanted and Tangled as well. To be fair though if you write musicals what better company to work for than Disney? You’ve got to go where the money and awards are. Menken now has eight Oscars, seven Golden Globes and eleven Grammys and he wouldn’t have got those writing horror pastiches for limited audiences. Little wonder then that Robert Lopez, coming from a similarly irreverent musical background having co-created The Book of Morman and Avenue Q, has written the songs for Frozen. Frankly Richard O’Brien missed a trick here, I’d have loved to have heard his Lion King. I’m sure ‘transsexual trans-savannah’ would have been a big hit. Alan Menken’s earliest Oscar recognition was for Little Shop though, with ‘Mean Green Mother From Outer Space’ getting a nomination for best song (it wouldn’t qualify now having not been written specifically for a film). Clearly Menken and Ashman’s tunes are massively instrumental (pun intended) to the 1986 film. Extremely catchy without ever running the risk of getting annoying (something ‘Let It Go’ and ‘Do you Wanna Build a Snowman’ have perhaps failed on) the songs are a brilliant riff on 1960s rhythm & blues and soul music. A little bit doo-wop-da-doo, a little bit Motowny yet totally original and highly witty. Still, it takes more than a great stage musical to make a great film musical. Just because something works in the theatre this does not guarantee a smooth transfer to screen. The key is in the performances. Movies that just play out the material with little concern for the medium of cinema tend to come across as largely pointless (Mama Mia!, Chicago) but those that are ready for their close up hold up a little better. There are two ways you can go here. You can proceed with great conviction (West Side Story, Les Miserables) or with great camp (The Wizard of Oz, Rocky Horror). Interestingly, despite its broad comedic tone, Little Shop of Horrors actually manages both. The leads, Seymour, Audrey and Mushnik, play it relatively straight, while those around them, Orin Scrivello DDS, DJ Wink Wilkinson, Christopher Guest as the shop’s first customer, dental patient Arthur Denton and Levi Stubbs’ Audrey II, all ham it up like there’s no tomorrow. I use that turn of phrase deliberately because originally the film was to end with the end of the world, there was no tomorrow. In the first cut of the film, as in the stage version, the mean green mother swallows the heroes whole and instigates a full on alien invasion. There are scenes, that only surfaced with the movie’s Bluray release last year, of the plant and it’s rapidly growing army of off cuts destroying cities and decimating the population. In this footage the effects and animation step up to a different scale from that which you see in the rest of the film. Frank Oz’s previous expertise with Kermit, Miss Piggy and Yoda already adds so much to the impressive puppetry behind everyone’s favourite giant man eating plant but in these deleted scenes Audrey II breaks out of its limited little shop location and really shows what she can do. This would clearly all be done with CGI now and while this might smooth over some of the cracks it would also kill most of the charm. This ending is certainly darker and perhaps jars a little with the tone of what has come before it. Wisely I think, preview audiences objected to the bleakness and the denouement was reshot in favour of a happier ending. Like The Princess Bride, Little Shop of Horrors is an eminently rewatchable, highly quotable deadpan comedy masterpiece that takes a genre and lovingly mocks and celebrates it at the same time. A remake of the movie would be the last thing anyone wants but an epic restaging of the show could be great. Now is the time people, make it happen. Hmmm! Little Shop of Horrors may not do that well here. Other than the narrators there is only one key female part (arguably, I’ll come to that in a moment). Audrey, sweet Audrey is not exactly an empowered woman. She is in an abusive relationship, which in itself does not make her weak, but she dreams of escaping this and her skid row slum life by marrying another man. Audrey is a bit of a caricature, but that is true of everyone in the film, and while her inclusion in the story is not really tokenism other females from the stage version have been cut out, notably Mushnik’s wife and mother. Of course there is a suggestion that Audrey’s namesake is a lady too. 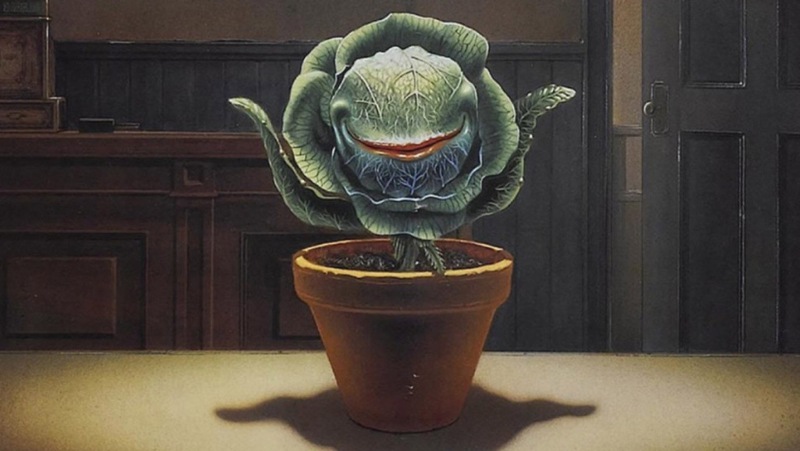 Oddly Total Film did list Audrey II in its list of the top 200 female film characters but just because it has a girl’s name and it produces offspring I’m not sure this makes it a woman. Plants don’t tend to have genders, even the talking ones. Yes, I know about dioecious flowers, I’ve Googled it, but most plants are hermaphroditic. Sorry Twoey, you don’t qualify. It is a PG but people do get chopped up and eaten. None of it is graphic but it works on the same level as Hitchcock’s The Birds does for adults; it’s the implication that’s scary. There is a little bit of course language in there too. I’d say its okay for sevens and up depending on the sensitivity of your children.